For the past few weeks I have been doing a challenge with my gym and it includes meal prepping. I will give a full review of the challenge when I’m done but I wanted to share my favorite breakfast recipe I’ve been using! 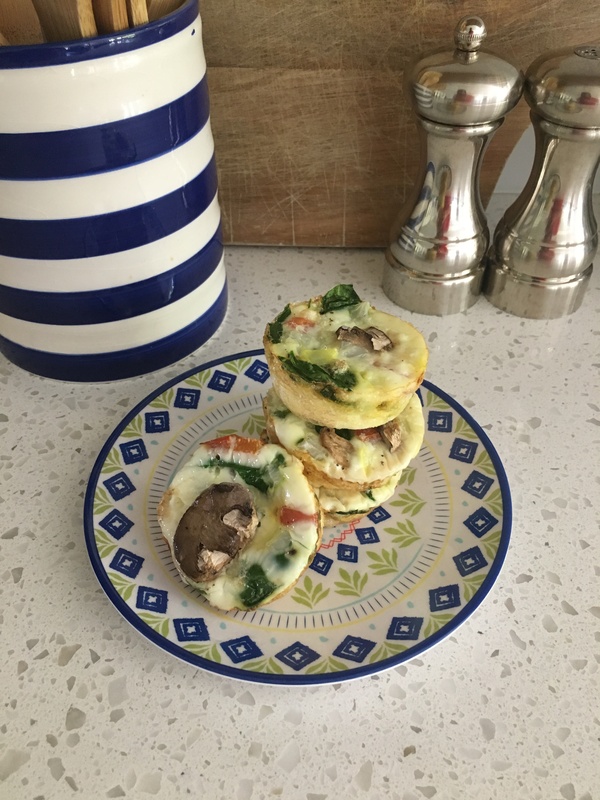 These egg white cups are SO simple and one batch can get you through the whole work week! Start by chopping up any veggies you want to use. I do about 1/4 cup of each. I use spinach red bell pepper, green bell pepper, and onion. Then layer your veggies in a greased muffin tin. I have been using egg whites, but this could easily be done with whole eggs. I pour the egg whites into the measuring cup because of the easy pour spout and to add salt and pepper to taste before I add the eggs into the pan. Fill the cups almost all the way full and place in the oven for 20-25 minutes at 350 degrees. I have been loving these! I can get protein that keeps me full and I also get a serving of vegetables that taste great. It’s a win win! I will definitely continue to make these even when I’m done with my challenge. They are great to pop in the microwave for 30 seconds and take on the go. If you try out this recipe, let me know!